It's a question we get a lot here at Holy Hen House. And with good reason! It can be tough to find a devotional that not only a) keeps your attention but also b) contains some good scriptural "meat". 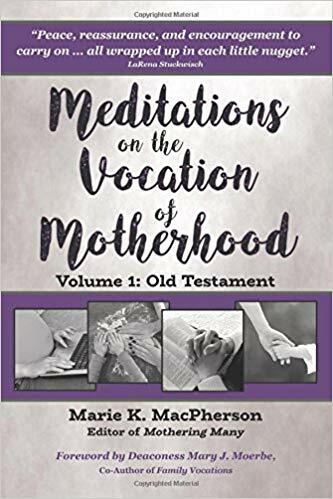 So when one of our readers asked if we would review her latest devotional book, "Meditations on the Vocation of Motherhood, Volume 1: Old Testament", we were eager to do so! Biblical content: As the title says, each one of these devotions are based on passage/section of the Old Testament, drawing a correlation to our journey as mothers. Not only are these connections made by Marie on point and thought-provoking, they also remind me of some of the Bible history I learned as a child but have long since almost forgotten. I love the way her correlations draw me back into the text and have instilled a hunger for more knowledge of these Biblical events. Length: Each devotion is only one page long in the 5' x 7' book, which make them absolutely perfect for reading while drinking your coffee, eating breakfast or in between running your kiddos from point A to point B. Broad Audience: Somehow Marie has found a way to write to all mothers, not just those who stay home, not just those with little kids, not just those with careers. She writes in a general enough manner that I am quite confident that all moms could glean encouragement from her words. Any criticism I would have for this devotional would be purely based on preference. If you are a story-teller like me and love somewhat in-depth, real-life experiences shared by the author, you may miss that in this book; however, this also makes for a more direct, shorter message which I can definitely appreciate. All-in-all, if you're looking for a devotional which is strong in Scripture and provides great encouragement to mothers in all stages of parenting, than Ms. MacPherson's book is a must-grab for you. What a great gift it would make for the other mothers in your life! You can purchase the book and read other reader's thoughts about the book on Marie's website HERE or find it on Amazon. Click here to print the bible study! I hope you enjoyed our seventh online bible study from the series Women Wrecked // Women Redeemed! *If you use the bible study in a group or share it with another please give source credit to me and the blog. Thank you! Hypocritical or not, that is the truth. And it’s the main reason I hedged when originally asked to be a part of this wonderful creation called Holy Hen House. Could God really use me, a broken, wandering sinner and could I ever meld with such a seemingly put-together group of Christian sisters? I figure that it’s time to come clean. I am no Martin Luther. I do not spend hours a day in dedicated meditation and prayer and I am ashamed to admit that days go by without my Bible being opened – sometimes I have to stop and think for a moment just to remember where it is. I rush through my mornings, my afternoons, my evenings without giving the numerous devotional books I’ve purchased over the years a second thought (and yes, I have purchased quite a few – and even started some of them). However, the paradox of it all is this: these same reasons that made me feel unfit to be a Holy Hen House writer are the same reasons why I felt God leading me to accept the calling. Not only did I feel my own faith would benefit from the challenge of providing a weekly or bi-weekly devotion for others but I also, somewhere in the depth of my soul, truly believed (and still do) that a lot of what online content needs these days is truth. Realism. Women especially need to know that it is okay to not be pinterest perfect when it comes to their homes. Their relationships. Their families. Their lives. And perhaps, just may be, this can be said of their FAITH as well. Today I write from the heart – I’m letting you all in and admitting that I don’t have it all figured out where my personal devotion/meditation is concerned. And I’m finally committing to myself and more importantly to God, to try doing something different. Obviously what I’ve been doing the last few years hasn’t been working. I’m one of those “lucky ones” who was raised in a Christian home, sent to a parochial elementary and high school and managed to find an amazing Christian man to spend my life and raise a family with. Yet as much as these facts are all incredible blessings, they also bring with them a set of their own challenges. In a life where faith in God and access to the Word of God has been so “available”, how does one keep her own faith alive, striving, and growing? I began asking myself this question several years back when I made the realization that church on Sunday just wasn’t enough for me anymore. Sure, I know that Jesus Christ, the Son of God is my Savior. It is my hope and prayer that all of you reading this feel that way, too. But after more than thirty years of hearing this great truth, isn’t it time to move past the “spiritual milk” (Hebrews 5:11-14, 1 Peter 2:2) and onto a more living, breathing relationship with my Heavenly Father? So just how do I accomplish this? Perhaps you currently find yourself in a similar state…just how do you accomplish this? The difficult part of the answer to this question is that there isn’t one. Just as God has created each of us to be our own people, with our own set of circumstances, our own experiences, and our own personalities, so we will each respond in our own way to different methods of meditation and time spent in His Word and devotional materials. But the important part is that you start somewhere. As I mentioned above, I have purchased more books – which still remain unread -- than I would like to admit. Always thinking that the problem had more to do with the content, the length of the devotions, the author, the subject matter, or some other excuse, I would soon tire of each and it would slowly be transitioned back to the bookshelf. It was not until I began to not only be honest with myself about a lack of personal spiritual growth but also with others that I trust when God began to open my eyes to part of the problem. A dear friend of mine, as a follow up to a heart-to-heart which we had shared on this very topic, recently wrote to me in an email, “I just want to encourage you [to do something], however small, maybe it's one passage a day that you ponder.” For some reason, this statement spoke to me. It finally dawned on me that perhaps I was over-complicating things. How much money had I spent on countless books written by mortal men when I have had multiple copies of the most infallible source of spiritual encouragement, enlightenment and wisdom known to man sitting within arm’s reach of me at home? Please do not misunderstand me: I don’t see anything wrong or “wasteful” about supplementing personal time spent in the Word or in prayer with a doctrinally sound devotional or other spiritual writing. But for someone like me, who is ultimately seeking a closeness with God through developing a habit of being “in the Word” daily, doesn’t it make more sense to actually start “in the Word”? It was such a simple answer. Over the past week or so, I’ve challenged myself to do just that: find one passage a day to “ponder”. I re-write it on a half sheet of paper and hang it wherever I happen to be sitting on that particular day as I read it. Sometimes this is at work, sometimes at my desk at home, sometimes in my kitchen. Wherever it may be, His Word follows me and I cannot help but re-read it over and over as I go about my tasks of the day. This method may not work for you. Perhaps you are closer to having it all “figured out” than I am – but I truly believe that we could all use a boost. I look forward with great anticipation as to where this leg of my faith journey will lead me and I’m excited to share it with you along the way. What have you found to be most helpful in the strengthening of your relationship with your Heavenly Father? Please feel free to share in the comments below!